In the idea for this week, a killer computer is trying to connect itself up to bombs. You must stop it by connecting it up to flowers instead, in this puzzle game of circuit diagrams. This puzzle game combines the currently unfounded fear that computers will try and kill us, with cute circuit diagrams and challenging levels. This is a puzzle game where you must beat the computer and the clock to cut off all routes to the bombs. Puzzle pieces have images of circuit diagram elements on them. You need to try and make the circuit end up at a flower and not a bomb. To build a route, you can use one of the 4 possible tiles on the left of the screen. Or request new tiles. You are working against the clock make sure that when the time runs out there is either a route to straight to a flower or there are no possible routes available to the bombs, because if there are, the computer will find them and you will loose. As you place your tiles down, the computer is continually thinking. At increasing intervals, the computer will rotate tiles, in order to stop you from reaching a flower. Players can destroy tiles that are already placed down, put down one of the 4 available tiles, or request a set of new tiles, but they cannot rotate tiles. The game as played as a series of levels. 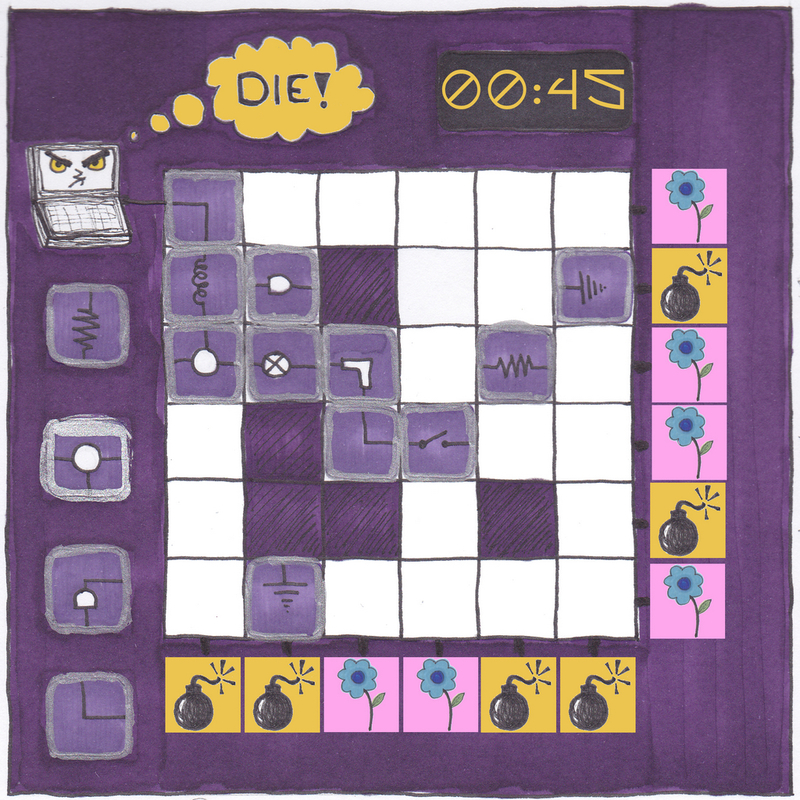 In each level, the game board has a different set up of flowers and bombs on the side, as well as different forced blank squares on the board. Eventually the board may not even be square anymore. This means that the game will continue to challenge the player as they improve. The key to making this game compelling will be making sure the initial puzzles are easy to solve, but that the game grows in complexity and the challenge increases. This will be done by changing the starting game board (where the bombs, flowers and blank tiles are), changing the powers of the Killer Computer (it might act faster or be able to do more to ruin the current path) and giving the players extra powers or more tile options. As players become experienced at playing the game, it is likely that the symbols on the circuit diagram tiles will start to have special powers. For example, they might destroy some tiles or bombs, allow more links, and so on.